A few months ago we went to my sister's house for a taco dinner. She had a big bag of uncooked tortillas from Costco. I had never seen such a product before. How do they work? Well, just heat up a skillet or griddle, slap down a tortilla, watch it brown and bubble for about 30 seconds on each side, and presto, it is ready to eat. They are so good I'm not sure if I can ever eat a run-of-the-mill, precooked tortilla again. 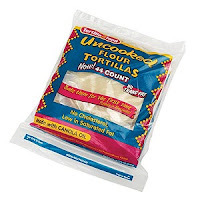 We don't have a Costco membership, but we eventually tracked down some Tortillaland brand uncooked tortillas at select Walmart and Harmons locations. We have been going through packages like crazy ever since, so I had the bright idea to try making tortillas from scratch. I found several recipes online which were all pretty similar. I opted for one that doesn't call for lard. In a mixing bowl stir together the flour, baking powder, and salt. Add vegetable oil to the lukewarm milk and whisk briefly to incorporate. Gradually add the milk to the flour mixture, and using clean hands, work into a sticky dough. Place the dough onto a flour dusted surface and knead vigorously for about 2 minutes, or until the dough is no longer sticky. Return dough to bowl, cover with a damp cloth and allow to rest for 10-20 minutes so that it will be easier to roll out. Divide dough into 8 balls of equal size, cover them, and let them rest again for about 20 minutes. Dust a clean surface with flour. One at a time, remove each ball of dough. Press it out into a 5-inch circle. 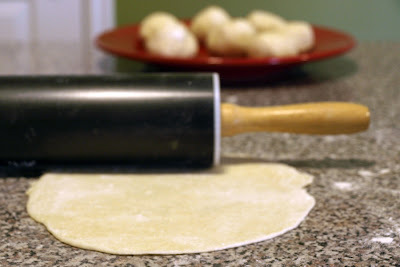 Using a flour dusted rolling pin, roll it out from the center until the tortilla measures a little less than 1/4 inch thick and is a 7 or 8 inch circle. Transfer the tortilla to a dry preheated skillet or griddle. When the tortilla begins to blister, allow it to cook for 30 seconds, flip it, and cook the other side the same way. Remove tortilla, place it in on a clean towel and cover loosely with another towel. Repeat for remaining tortillas. All in all, these turned out pretty good for a first time experiment. 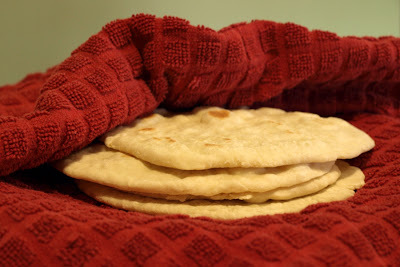 I couldn't get them as thin as the pre-packaged ones with a rolling pin—when they cooked they would puff up to about the thickness of flatbread (maybe I should ask for a tortilla press for Father's Day). But since the recipe only calls for a only a handful of ingredients that are likely already in your cupboard, making them yourself is quite cost effective. Of course you are paying for the convenience of just pulling a few out of a bag and throwing them on the stove. There won't always be time to make them from scratch, but if you have 45 minutes to spare, I recommend giving it a try. Very domestic of you Dave. I love the tortilla land.. and those ones that you made look delicious. Perhaps I'll give them a try sometime. I've always wanted to make tortillas, I also want to try and make pita bread. When I make tortillas, I end up the same as you, with them a little thicker than I want them to be. Let me know how the tortilla press works for you. Pita bread is a little easier, since you roll it out thicker than tortillas, but you have to be careful when rolling it out so it's even. It won't puff out if you roll part of it too thin or get a hole and try to repair it. looks like we may have something for the next kup. 100 Years 100 Movies: Why the Long Face?